1x Gift Copy of Bioshock Infinite. This must be a part of your offer. A few steam trading cards, specially both BlazBlue games' cards. Something like 6~10 cards would probably be enough, depending on the cards. 1x Gift Copy of A.R.E.S. Extinction Agenda EX. 1x Gift Copy of BattleBlock Theater. 1x Gift Copy of Divekick. 1x Gift Copy of Don't Starve. 1x Gift Copy of ENSLAVED: Odyssey to the West Premium Edition. 1x Gift Copy of FINAL FANTASY IV. 1x Gift Copy of Gunpoint: Special Edition Extras. 1x Gift Copy of Mark of the Ninja: Special Edition DLC. 1x Gift Copy of Mercenary Kings. 1x Gift Copy of Metal Slug X. 1x Gift Copy of Shadowrun Returns. 1x Gift Copy of Shantae: Risky's Revenge - Director's Cut. 1x Gift Copy of Shovel Knight. 1x Gift Copy of Skullgirls. 1x Gift Copy of Strider. 1x Gift Copy of The Walking Dead: Season Two. 1x Gift Copy of Wings of Vi. 1x Gift Copy of AwesomeNauts. 1x Gift Copy of Starstorm DLC. 2x Gift Copies of two announcers (Coco, Wildlife and/or SUSI). 1x Gift Copy of a skin (among Jotunn Skølldir, Wraithlord Scoop, Loninator Skin, Grim Genji). 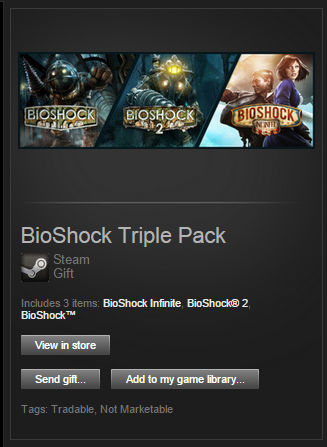 I already have Bioshock 1 & 2, and received Bioshock Triple Pack as a gift from my girlfriend. I feel like it would be a waste to use the pack just for Bioshock Infinite, so I'm willing to trade the pack for a gift copy of Bioshock Infinite + 1 of the options described above. Only ever traded among friends, but as far as I know, Bioshock 1 is among the greatest FPS of all time. Bioshock 2 is a great game, alright. There have been many opportunities to acquire these two titles for cheap along the years, so I tried to choose options that are around what I perceive is the value of these two games. Your Steam Inventory is private, I wanted to check what cards did you have. how many cards do you want? Depends on the set. Took the liberty to check your inventory, and I'd take a copy of Bioshock Infinite (As I asked) and your cards from Batman games (Arkham City and Origins). I can wait until you can buy Infinite on sale and get all 3 games through this trade, no hurry. If you throw-in the gift copy I want of Bioshock Infinite (I can wait for you to get it on sale for about US$5,87 ~US$7,49), I'd like to get Infinite + your cards from the sets of Hero Siege, To The Moon and Risk of Rain. 3 keys for Bioshock triple pack? I'd be interested in doing this, but I'll have to see if I can trade my gift copy of Bioshock for one of the games you have listed. Interested in payday 2 ROW tradable for bioshock triple pack?